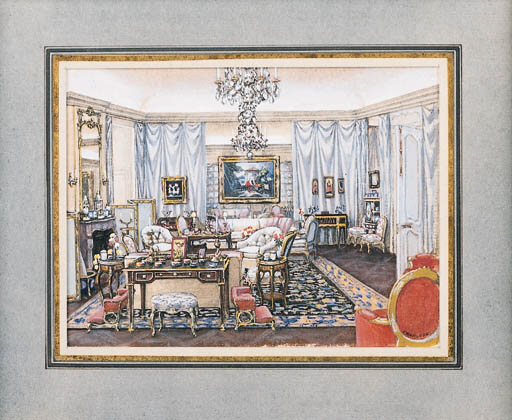 These watercolors show the Living-Room and Garden-Room of Mr. and Mrs. Deane Johnson's home in Bel Air, California. The watercolor of the Living-Room is especially interesting because it shows the Louis XVI secretaire from Pavlovsk (lot 256 in this sale) next to the Louis XVI console table made by Riesener for Marie Antoinette's Cabinet Intérieur at Versailles in 1781. These pieces were the highlights of the sale of the Johnson Collection (sold Sotheby's Parke Bernet, New York, December 9 1972, lots 101 and 98 respectively). Both were subsequently sold from the collection of the British Rail Pension Fund, Sotheby's London, November 25, 1988, lots 29 and 33 respectively. The watercolor also shows on the mantlepiece the pair of urns (lot 229 in this sale) and the single centerpiece (lot 230 in this sale).